Research has shown that certain strategies can be implemented in the cafeteria setting that may help students make more nutritious food choices. Schools are in a unique position to provide healthful foods and promote healthful eating among our youth. Research has shown that certain strategies can be implemented in the cafeteria setting that may help students make more nutritious food choices. 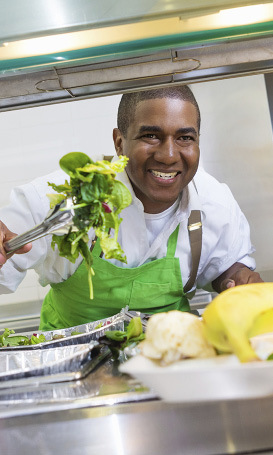 Q: What are the dietary guidelines and how do they apply to the National School Lunch Program? The Dietary Guidelines for Americans are based on current nutrition research and provide food and beverage recommendations for those 2 years and older. The guidelines are updated every five years based on recent research. These recommendations are intended to help Americans make healthful food choices and serve as a basis for nutrition policies and programs in the U.S., including the National School Lunch Program. Q: What nutrition messages do the Dietary Guidelines recommend? The Dietary Guidelines recommend balancing calories by enjoying food, but eating less and avoiding oversized portions. The guidelines also recommend increasing fruits and vegetables to cover at least half of your plate at each meal, making half of your grains whole grains and switching to fat-free or 1 percent milk. Nutrition experts recommend that children and adults drink water instead of sweetened beverages to quench thirst and choose foods such as soup, bread and frozen meals that have lower sodium content. Q: How can school food service personnel set up the cafeteria to help students make more healthful choices? Place vegetables, fruits or the most nutrient-dense entrée at the front of the serving line. Students will fill the majority of their plate with the first food item they see. Provide sliced or cut-up fruit that is easier and more pleasurable for students to eat. Offer two or more different vegetable options to give students more choices. Offer a salad bar to increase the amount of vegetables provided. Q: What other strategies can be implemented in the lunchroom? Naming vegetables and nutrient-dense entrees with fun, attractive, age-appropriate names potentially can increase their consumption. Research has shown that using positive health messages such as “Eat fruit and be slim” (instead of negative messages such as “Don’t eat candy or you’ll get fat”) can encourage healthful eating. Q: What Web resources are available to help make school lunchrooms more healthful? Smarter Lunchrooms Movement - Training materials, published research articles, webinars and best practice strategies can all be found here. Cornell Food and Brand Lab - Browse studies on smarter lunchrooms, marketing nutrition and beating mindless eating. You also can find short educational PowerPoint presentations and teaching cartoons at the site. Centers for Disease Control (CDC) - Discover data and statistics on youth dietary and physical activity behaviors. Tools, training and resources are just a few of the materials offered on this site. U.S. Department of Agriculture Food and Nutrition Service - Find fact sheets, recipes, policy guidance and food-buying guides. USDA MyPlate - Learn about the food groups and download a wealth of resources including infographics, toolkits and training materials and discover fun activities for students. Nutrition experts have recommended using more dry edible beans, lentils, chickpeas and split peas on school menus. Visit this site and click on “Quantity Recipes” for many examples.